ABSTRACT. Gomphillus Nyl. 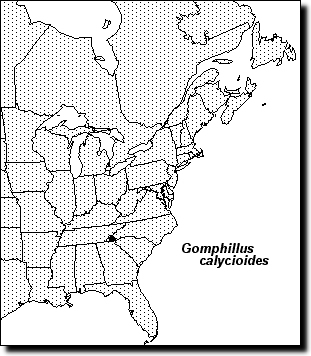 (Gomphillaceae) is reviewed for eastern North America. Two species are recognized, G. americanus Essl. in the southeastern and Ozarkian United States, and G. calycioides (Duby) Nyl., newly reported for North America from two collections in Macon County, North Carolina. Gomphillus americanus possesses hyphophores and capitate-stipitate apothecia, whereas G. calycioides lacks hyphophores and has sessile, turbinate apothecia. Gomphillus caribaeus is described as new from the Greater Antilles. 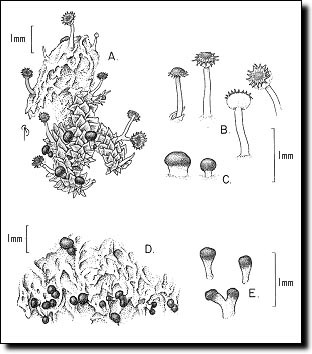 Gomphillus is probably of as much interest to bryologists as it is to lichenologists because it overgrows bryophytes. Certainly that was my initial fascination. In North America it is truly one of the most spectacular crustose lichens with its relatively large hyphophores that look like little, stalked starbursts. Subsequent study has demonstrated that our common North American species is unique in the genus in this regard and may even deserve generic segregation. In the meantime, though, the genus can be recognized by the thin, gelatinous, glossy thallus (like most members of the Gomphillaceae), hyphophores (when present) stalked and peltate, and linear, multiseptate ascospores. TYPE SPECIES: Gomphillus calycioides (Duby) Nyl. REFERENCES: Esslinger 1975; Kalb & Vezda 1988; Vezda & Poelt 1987. ILLUSTRATIONS: Black and white photograph: Esslinger 1975, p. 191 (americanus); drawings: Vezda & Poelt 1987, p. 189 (americanus), Kalb & Vezda 1988, pl. 14 (calycioides, ophiosporus), Ozenda & Clauzade 1970, p. 435 (calycioides). Thallus crustose, thin, gelatinous; photobiont chlorococcoid. Ascomata apothecia, sessile and pseudostipitate or stipitate, blackish above, pale below; exciple well developed, sometimes becoming a pseudostipe, brownish; epithecium red-brown, nongranular; hamathecium of numerous, anastomosing paraphyses, less than 1 ?m wide, the apices not swollen; asci 8-spored, narrowly cylindrical, with an apical tholus, I? ; ascospores very long, thread-like, multiseptate, hyaline. Conidiomata pycnidia or hyphophores; pycnospores minute, ellipsoid; hyphophore conidia elongate, branched, multiseptate. Chemistry none. Gomphillus is recognized by its grayish-green, thin, shiny thallus, typically growing over bryophytes, in conjunction with thread-like, multiseptate, hyaline ascospores. There are but three species currently described in the genus, two of which are in our flora. The third, G. ophiosporus Kalb & Vezda, is much like G. calycioides, but differs by a neotropical distribution and ascospores spirally twisted within the ascus. It was described from Ecuador with an additional specimen cited from Costa Rica. I have seen additional material at NY from Puerto Rico, Dominican Republic, Jamaica, and Brazil (Goiás and Rio de Janeiro). There is a fourth, undescribed species in the Caribbean . 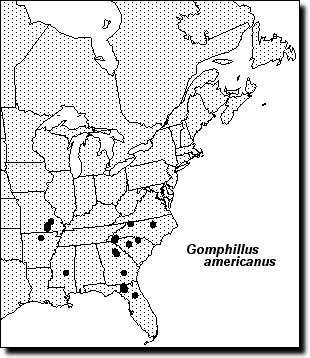 Gomphillus americanus, the widespread species in eastern North America, is significantly different from these other three species in having large, distinctive hyphophores and stipitate apothecia. However, the ascospores are similar in all species. The genus occurs in westernmost Europe from Portugal to Norway, including the British Isles, Macaronesia, eastern North America, tropical America, and Hawaii, almost always growing over bryophytes. Gomphillus americanus Esslinger, Mycotaxon 1: 189. 1975. Type: U.S.A. North Carolina. Wake County: ca. 5 mi SE of the town of Wake Forest in the vicinity of a large granite outcrop along the Cedar Fork of the Little River, Esslinger 3184A (holotype US!, isotype DUKE!). Thallus thin, shiny, gray to pale green, typically growing over bryophytes and seemingly killing them. Apothecia sessile when young, becoming stipitate and compound with age, capitate, blackish, appearing pruinose, in section more or less hyaline throughout except brown in basal part of exciple; paraphyses very slender, less than 1 µm wide, laxly anastomosing; asci cylindric, 220--340 µm long, 7--10 µm wide; ascospores seldom seen (usually immature), linear, hyaline, more or less spiral within the ascus, ca. 200 µm long, ca. 2--2.5 µm wide, transversely pluriseptate, the cells mostly 8--9 µm long. Hyphophores stipitate; stipes (0.8--)1--1.2(--2.0) mm tall, mostly single, occasionally branched, white; apical plate peltate, red- to gray-brown, ca. 0.3--0.45 mm in diameter, essentially entire when young but at maturity becoming deeply divided to ca. ½ its radius into 8--38 arms; conidial mass beige to pale brown in mass when dry, white when moist, completely encircling the stipe, strongly and rapidly hygroscopic, when dry the arms of the apical plate extending well beyond the subtending conidia, when moist the conidial mass expanding to almost full diameter of apical plate; conidia densely packed, filiform, irregularly branched, ca. 1.5--2 µm wide, multiseptate, each cell ca. 3--4 µm long. Pycnidia not seen. ECOLOGY: Growing over mosses, typically Leucodon, but also Entodon, and hepatics, sometimes extending onto bark, on branches and trunks of trees. Most commonly found growing over Leucodon on horizontal branches of Juniperus in seasonally dry habitats. Probably common, but seldom collected, on mosses on horizontal branches of trees, often Quercus, in the canopy. DISTRIBUTION: From North Carolina to Florida and around the southern end of the Appalachians to Mississippi, north to Arkansas and Missouri (FIGURE 2--left); a single collection has been seen from southern Brazil (Santa Catarina) with only hyphophores and no apothecia. Gomphillus americanus is easily recognized by its relatively large hyphophores with a peltate apical plate which becomes divided upon maturity and, with a handlens, appears as a small starburst. It is most often seen, sometimes in patches to 10 cm or more in diameter, growing over the moss Leucodon julaceus on large, horizontal branches of old-growth Juniperus. Apothecia are uncommon, but not rare. They are distinctive in that they proliferate and become more or less compound, and when mature sit atop a short stipe. In G. calycioides the apothecia are turbinate and not truly stipitate. In G. americanus mature apothecia appear pruinose (although no crystals could be detected), and thus somewhat grayish. However, in G. calycioides the apothecia remain black with no hint of pruina. In G. americanus the ascospores are more or less spirally twisted within the ascus, whereas in G. calycioides they are straight or irregularly and laxly twisted. Considering the fact that G. americanus is the only species in the genus with hyphophores and that the apothecia are capitate-stipitate rather than turbinate, it would not be surprising if eventually it were to be recognized as a new genus. Gomphillus calycioides (Duby) Nyl., Bot. Notiser 1853: 165. 1853; Baeomyces calycioides Delise ex Duby, Bot. Gall. 2: 636. 1830; Mycetodium calycioides (Duby) Massal., Flora 39: 285. 1856 & Sched. Crit. 3: 63. 1856; Gomphillus calycioides var. polycephalus Nyl., Syn. Meth. Lich. 1(2): 175. 1860, nom. illeg. Type: France, "super muscos quos incrustat in sylvâ Briquebec [Manche] detexit cl. Despréaux" (holotype G, n.v., isotype H-Nyl, n.v.). Baeomyces microcephalus Tayl. in J. Mackay, Fl. Hibern. 2: 78. 1836; Gomphillus calycioides var. microcephalus (Tayl.) Nyl., Syn. Meth. Lich. 1(2): 175. 1860; Gomphillus calycioides fo. microcephalus (Tayl.) Nyl. ex Crombie, Monogr. Lich. 1: 108. 1894. Type: Ireland. "On the surface of Hypnum [Isothecium] myosuroides, on Carig mountain, County of Kerry: also on Jungermannia [Frullania] dilatata," 26 Dec 1834, Taylor (holotype FH!, isotype H-Nyl, n.v.). Thallus thin, shiny, gray to pale green, typically growing over bryophytes and seemingly killing them. Apothecia sessile, turbinate and thus pseudostipitate, black, not pruinose, in section more or less hyaline above, brown in extensive basal area of exciple; paraphyses very slender, less than 1 µm wide, laxly anastomosing; asci cylindric, 290--380 µm long, 9--11 µm wide; ascospores linear, hyaline, straight or laxly twisted within the ascus, ca. 200 µm long, ca. 2.5--3 µm wide, transversely pluriseptate, the cells mostly 3--4 µm long. Hyphophores none. Pycnidia not seen in North American material, reportedly (James & Brightman 1992) black above, pale below; conidia ellipsoid, 2--4 × 0.5--0.7 µm. ECOLOGY: Growing over bryophytes in moist hardwood forests at ca. 1600 m.
DISTRIBUTION: Known in North America from two collections made in September 1989 in the Nantahala National Forest in Macon County, North Carolina, on Wayah Bald (Buck 17642) and Wine Spring Bald (Buck 17667, both NY) (FIGURE 2--right). Since publication of this paper in Lichenographia Thomsoniana, additional collections have been found: North Carolina. Macon County: Nantahala National Forest, Southern Nantahala Wilderness Area, along Appalachian Trail between Deep Gap and Standing Indian (Buck 32589); Clay County: Nantahala National Forest, along Buck Creek Road, 1.2 mi NNW of US 64, 2.2 mi W of Macon Co. line (Buck 34984, 34987). Georgia. Union County: Chattahoochee National Forest, along Duncan Ridge Trail from Wildcap Gap to Coosa Bald, off Forest Service Road 39, ca. 1.4 mi NNW of GA 180 at Wolf Pen Gap (Buck 34902, all NY)Also known from westernmost Europe, including the British Isles, Italy, Macaronesia, Hawaii, and Chile. ACKNOWLEDGMENTS: First and foremost I thank Richard C. Harris for nurturing my interest in lichens and for assisting at every step of the way. Tor Tønsberg reviewed my manuscript. Bobbi Angell made the illustration. Jim Hinds generously made my distribution maps. Finally, I thank the curators of DUKE, FH, and US for the loan of specimens. Esslinger, T. L. 1975. A new North American species of the lichen genus Gomphillus. Mycotaxon 1: 189--192. James, P. W. & F. H. Brightman. 1992. Gomphillus Nyl. (1853). Pages 256--257. In: O. W. Purvis, B. J. Coppins, D. L. Hawksworth, P. W. James & D. M. Moore (eds. ), The lichen flora of Great Britain and Ireland. Natural History Museum Publications, London. x + 710 pp. Kalb, K. & A. Vezda. 1988. Neue oder bemerkenswerte Arten der Flechtenfamilie Gomphillaceae in der Neotropis. Biblioth. Lichenol. 29: 1--80, pls. 1--39. Ozenda, P. & G. Clauzade. 1970. Les lichens: étude biologique et flore illustrée. Masson et Cie, Paris. 801 pp. Vezda, A. & J. Poelt. 1987. Flechtensystematische Studien XII. Die Familie Gomphillaceae und ihre Gliederung. Folia Geobot. Phytotax. 22: 179--198.